Inverness record their first league win of the season while Hearts suffer their second consecutive defeat, in the process spurning the chance to move clear at the top of the table. Thanks for your company tonight, we're back tomorrow for a bumper edition of Scottish Premiership action, including the lunch-time offering of Aberdeen v Celtic. "We didn't deserve to win the game tonight." "We looked a shadow of the team we've been. Now we've got a big game coming up [against Aberdeen] and we need to be ready. That's football. "The priority for the season is top six." "I kept saying we weren't too far away and lady luck had deserted us. In the first 15 minutes we were okay and then it was all Hearts and they were the better team. "We put it right at half-time by making a few alterations and I felt we were the better team in the second half. Someone mentioned we hadn't scored at Inverness this season so I'm absolutely delighted." Two league defeats on the bounce for the Jambos: food for thought for Robbie Neilson? "Personal battles all over the pitch and Inverness CT won all of them. If Inverness get all their players back then they can rise up the table." Anon: Robbie Neilson got it massively wrong tonight. McKirdy out his depth, centre forward out left and best player on the bench. Feel for the Jambos who made the trip. Robbie Devenney: What's that Inverness boy doing? Awful, but I wonder if Hearts were practicing with 10 men again? Smiles all round for those of an Inverness CT leaning. Goals by James Vincent and Swindon Town's Miles Storey sees a first league win of the season for John Hughes's side. Hearts spurn the chance to move clear at the top of the table. Five minutes of added time in the Highlands. Sitting in the dugout, head bowed, Hearts head coach Robbie Neilson mulls over what he's seen in the 90-odd minutes at the Caledonian Stadium. His opposite number John Hughes is sporting a beaming smile. Game, set and match Inverness. And it's a heart-warming story for loanee Miles Storey, the man from Swindon Town rifling the ball home from an angle following good work by Iain Vigurs to send the home fans wild. In sharp contrast, the visiting supporters are streaming for the exits. Hearts are reduced to 10 men as defender Juwon Oshaniwa is given his marching orders for clashing with Inverness CT substitute Tobi Sho-Silva. The Inverness man crumpled on the line and referee Steve McLean flashes red. Inverness CT midfielder Greg Tansey shows no respect for royalty as he earns a booking for chopping down Prince Buaben. Can Hearts profit from a promising set piece? No, they can't. A tidal wave of frustration for Robbie Neilson in the Hearts dugout. Storey stands up a sumptuous cross into the Hearts box and Inverness CT substitute Tobi Sho-Silva leaps highest but sees his header sail over the bar. John Hughes shuffles his Inverness pack: Ryan Christie, who created the Inverness goal, is replaced by Tobi Sho-Silva. Hands up who's singing the Jim Diamond classic Hi Sho-Silva? The loan boy from Swindon Town, Miles Storey, dances down the left before sending over a deep cross but there are no takers in blue. Twenty minutes plus added time for Inverness CT to hold on for their first league win of the season - or Hearts to hit back and claim at least a point. Jamie Walker comes on for Danny Swanson as Hearts continue to search for an equaliser. In fairness, the visitors have been largely flat tonight. Inverness CT spurn a great chance to spurn their lead. Ross Draper latches onto a great through ball but the Hearts defence recover in time before he has the chance to pull the trigger. Groans from the home fans who wanted Draper to get his shot away before the Hearts reinforcements stormed back. Robbie Neilson rolls the dice in an attempt to get his Hearts side back into the game. Billy King replaces Osman Sow. Neil, Tain: Let's turn that on its head Simon. Apart from Scott Brown I'm not sure who else from Celtic's first XI I'd put in the Aberdeen team. James Vincent's goals has energised everyone inside the Caledonian Stadium. The Inverness CT players have the wind in their sails; Hearts have been stung into action and both sets of supporters have found their voices. Game on! Danny Swanson is fouled by defender Danny Devine - the kind of 'devine' intervention that will see you booked. Steve McLean duly obliges. Hearts, though, can't profit from the subsequent set piece. Be still our beating hearts, we have a goal! Ryan Christie shows a great burst down the left, sending in a dangerous low cross and James Vincent reacts quickest to rifle the ball home from inside the six-yard box. The most impressive move of the game provides a goal. Can Hearts respond? Hope springs eternal! We will have goals in the second half, we're sure of it... Time for a half-time cuppa and a caramel wafer. Not sure what messrs Hughes and Neilson will be saying to their troops at the break. More efforts on target, hopefully, is the theme. "A real dip in excitement @ICTFC 0 @JamTarts 0 It needs a spark of creativity. Two penalties refused correctly for Hearts the main action." Miles Storey shows some lovely skill wide on the left but his run is halted by a rash foul by Callum Paterson - the Hearts man earns a booking for his troubles. Both sides are crying out for someone to show composure on the edge of the area and fashion a chance before the break. Hearts appeal unsuccessfully for a penalty as a sea of blue Inverness jerseys attempt to block a shot inside the box: it appeared more ball to hand. Ross Draper's diagonal pass finds Danny Williams and his cross from the by-line causes panic in the Hearts ranks but the visitors survive. Much better from the hosts. John Hughes's troops are trying to get Miles Storey involved in the game but the Swindon loan signing has had very little chance to shine. Hearts break on the counter at a fair pace but a promising opening fizzles out once again in the final third. It's that man Juanma again. Inside the Inverness CT penalty area, the striker tries to shift the ball between his right and left foot, dummying the defenders but himself also. He stumbles and loses possession - much to the delight of the home fans. "That was ridiculous he's got that in him. What is he, he must be 14.5 stone and goes down as if he's been hit by a hammer." Robbie Neilson comes to the edge of the technical area to offer his Hearts players some tactical advice. The visitors are knocking the ball about impressively until they get into the final third. Still 0-0 Both strong in possession but chances a rarity thus far. A bit more variety may pay dividends for either. Danny Swanson is playing with a swagger for Hearts and the visitors are growing in confidence as we hit the 20-minute mark. It remains goalless but both sides are warming to the task. Emboldened by recent forays into Inverness territory, Hearts come forward again but Ozturk fizzes a 30-yard screamer high over the bar. More than just a chance for Hearts as Juanma pick-pockets the Inverness defence. But the striker dithers on the ball with two unmarked team-mates in the box, before a theatrical tumble under the close attention of the home defence. Inverness's short, sharp passing comes to an abrupt halt when Greg Tansey fires a long diagonal for Carl Tremarco to show great control on the left. However, Calum Paterson is alive to the danger and another attack is snuffed out. The Inverness CT defenders will have their work cut out covering the dangerous Juanma tonight. The striker finds possession wide on the left before forcing a corner. Inverness deal comfortably with the set piece and we're still waiting for our first effort on target. Inverness seem content to pass the ball along their back line and wait patiently for an opening. They eventually work it back to goalkeeper Fon Williams, before going again. The hosts aim to test the Hearts rearguard as full-back David Raven chases down a long ball but it's played off him and it rolls out for a goal kick. Both sides appear intent on bombing forward at every opportunity. Neil in Tain: In reply to Simon, how about Shinnie and Logan? Both got into the SPFL team of the season Ahead of Celtics full-backs. Sam Nicholson is looking sharp for the visitors and the Inverness defence repel an early attack as Hearts venture forward with menace. We're under way in the Highlands! Morgaro Gomis is omitted from the Hearts squad on account of a family bereavement. Sean McKirdy comes in for the visitors. New signing Danny Swanson starts for Hearts. "We're pleased with what we've seen," says Hearts head coach Robbie Neilson. "We're coming here tonight to win it." Inverness CT boss John Hughes adds that his side could be sitting with nine points at the moment. However, with just three on the board form their opening six games, Hughes insists no-one is panicking. In fact, he says he's "felt the buzz" coming back to his squad in recent weeks. "Josh Meekings has been working hard on his fitness levels and this is his first game. We're delighted to welcome him back. "In terms of Miles Storey [on loan from Swindon Town] he's a really talented footballer. You'll see that. "He's integrated himself into the squad very well and he wants to go beyond and stretch the game. "I'm hoping he has a really good game tonight and, for the fourth months that we've got him until Christmas, he really shows the Inverness fans what he's all about." Simon, Glasgow: Aberdeen have been knocked out of Europe, but no mention of that by pundits. Aberdeen over-hyped again. Which Aberdeen player would get into Celtic's starting line up? 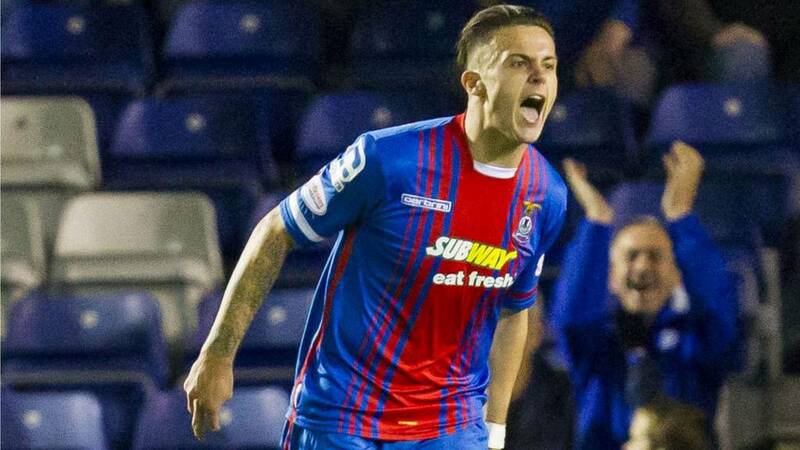 Inverness CT: Fon Williams, Raven, Meekings, Devine, Tremarco, Draper, Tansey, Vincent, Christie, Williams, Storey. Subs: Sho-Silva, Esson, Lopez, Foran, Wedderburn, Horner, Vigurs. Hearts: Alexander, Paterson, Ozturk, Igor Rossi, Oshaniwa, Buaben, McKirdy, Nicholson, Sow, Swanson, Delgado. Subs: Augustyn, Walker, King, Hamilton, Pallardo, Reilly, McGhee. Will Inverness record their first league win of the season or will Hearts seize the opportunity to move to the top of the table? defeat by Hamilton two weeks ago, Premiership newboys Hearts have been riding the crest of a wave. Fifteen points from their opening six games in the top flight and a League Cup victory against Forfar. John Hughes's side are yet to record a victory so far in the Scottish Premiership this season. Loan signings Miles Storey and Tobi Sho-Silva, from Swindon Town and Charlton Athletic, respectively, have been recruited to bolster their attack. "We're every bit as good as Hearts, trust me on that," said Hughes ahead of tonight's clash. "I expect it to be a tough game and I don't think there will be much in it but I expect to beat them." Don't you just love top-flight games on a Friday night? Inverness CT host Hearts at the Caledonian Stadium.